Monolithic Power Systems – Comfort International, Inc.
offices along perimeter walls. About 20% of the building is lab space with moderate loads. Lab areas require more cooling due to their heat generation. There is a burn-in room with ovens, a small wet lab, and two chemical lab hoods. One lab requires control of relative humidity. There is one main MDF server room and four smaller IDF rooms all requiring 24/7 cooling. There is also a gym. The building is U-shaped, with a new addition with a tennis court. Most of the perimeter office walls are glass. 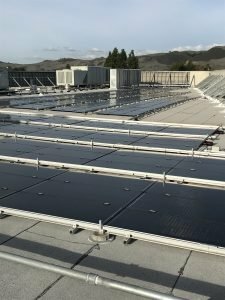 The goal was to find cost-effective ways to reduce the high energy costs at the Monolithic Power Systems building in San Jose, CA. The goal of the study was to find a way to reduce this significantly within payback less than 5 years. We did our energy benchmark review of the facility operations and conservatively estimate that we could reduce the energy usage by 29% with a guaranteed payback of 4 years or less. We completed the Efficient Energy Management Systems (EEMS) study and identified a solution to reduce their usage by 42% with over 926,000 kWh per year reduced, over 51,000 therms with a payback under 3.5 years. PG & E provided a rebate of $125,000. The audit found that the HVAC system, which is generously sized for the job, is using far more energy than necessary. By optimizing the system, "right-sizing"
where necessary, implementing a few mechanical enhancements, and revising control strategy, utility costs were cut by 42 percent. 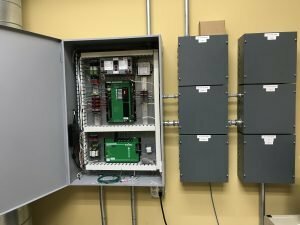 The old pneumatic controls were upgraded to a full building automation system. 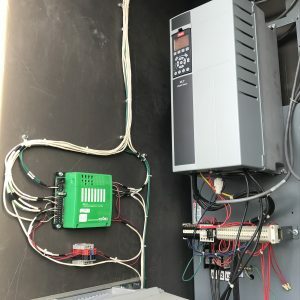 This new native BACnet control system controls all the HVAC systems with a custom graphic workstation tailored to meet the facility staff’s preferences. The laboratory was upgraded with a custom adiabatic humidifying system that replaced the electric steam system. Additionally, the entire interior and exterior lighting was upgraded with full LED lighting. The upgrade will offer other benefits, including improved comfort and reliability, improved air quality. In addition to cost savings, the upgrade reduced CO2(greenhouse gas) emissions by about 1,079,000 pounds every year. This is equivalent to removing 90 average cars from the road. 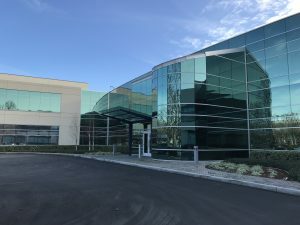 After the energy efficiency project was completed the company added a solar array which has enabled the facility to be a near Zero Net Energy facility.